This past weekend I gathered with friends for a weekend ski trip. The six of us have known each other since High School and in some cases since elementary school. Having lived in other parts of the country for much of my adult life, these times with life-long friends are to be savored. We’ve lived long enough to know that friendship, both new and longtime are not to be taken for granted. On this trip we remembered our good friend Larry who died of cancer over a year ago. Larry was a graceful skier with a playful spirit and as we skied down the mountain we sensed his presence. In gathering we were mindful of the many blessings in our lives. But we were also mindful of struggles and losses that each of us have experienced. Rather than dampening our mood we made a conscious choice to celebrate the gift of being together. We laughed and played and skied with joy. Richard Rohr in his wonderful book,’Falling Upward: Spirituality for the Two Halves of Life’, says by the second half of life we’ve been humbled, stumbled and fallen on our nose. Our struggles may have come from poor choices but more often by circumstances beyond our control. Paradoxically says Rohr, it is when we struggle that we become most open to that which is most important. The painful times says Rohr can help clarify that which we hold most dear. For this group of childhood friends, now in our late 50’s we have lived long enough to know that the gift of a good friendship is something to give thanks for, a gift to savor. 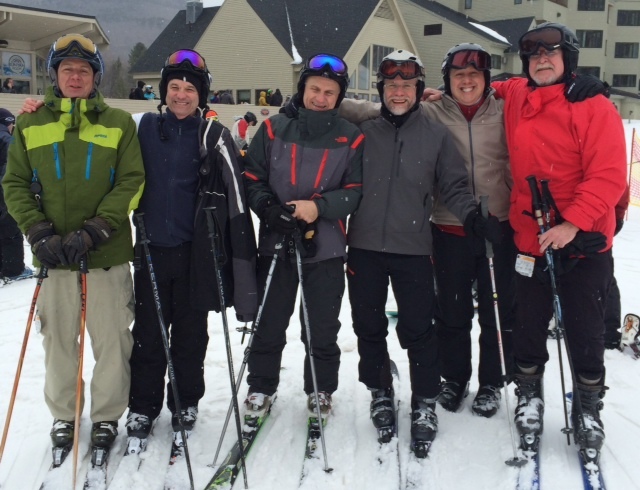 So we gathered for our annual ski trip to Loon Mountain. We skied remembering those no longer with us and we skied with gratitude for those who remain by our side. Joe, maybe next year you could work security for us? We need lots of help. Barbara, the official name of the annual gathering is Loonapalooza! A fitting name for sure.